Staying true to the philosophy of eating with the seasons, this recipe has the taste and feel of autumn. Beets are abundant at the farmers market. This elegant yet surprisingly simple dish is a beautiful addition for your holiday gathering. 1/8 cup chopped walnuts ( pant toasted in a pinch of sugar & dab of Butter) set aside. Preheat oven to 375. Put whole beets on baking sheet with parchment paper and drizzle with olive oil and a pinch of salt, then wrap them in foil. Wrap foil up and roast for about 45 minutes or until tender but firm. Remove skin from beets. When cooled, cut beets in half and then slice into thin strips. Then cut into tiny cubes. Set aside. In a medium bowl add shallots,sea salt, sherry vinegar, then whisk in olive oil and let sit for 30 minutes. Dressing can be made 1 day before. Place cubed beets and crumbled gorgonzola in a bowl and add dressing and mix gently. 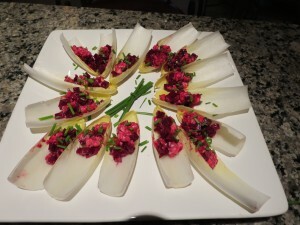 Keep endive cool until ready to serve. Separate leaves and spoon about a teaspoon of beet mixture towards the front of each endive leaf. Sprinkle with walnuts, chopped chives and fresh ground pepper. This dish looks beautiful on a white platter. Sprinkle plate with more chopped chives.